Eclectic (at Best): The Season of Justin and J.D. Among Fayetteville High School’s (FHS) many memorable sports teams, the 1961-62 basketball team must be rated as one of the best for both its talent and accomplishments.The team had a 27–2 record and did not lose a regularly scheduled game to a team in Arkansas. It was ranked first in the state during most of the basketball season. One of its players scored more points during the year than any other Bulldog basketball player had ever scored in a season. Another set a record for most points scored during his years playing for the FHS team. 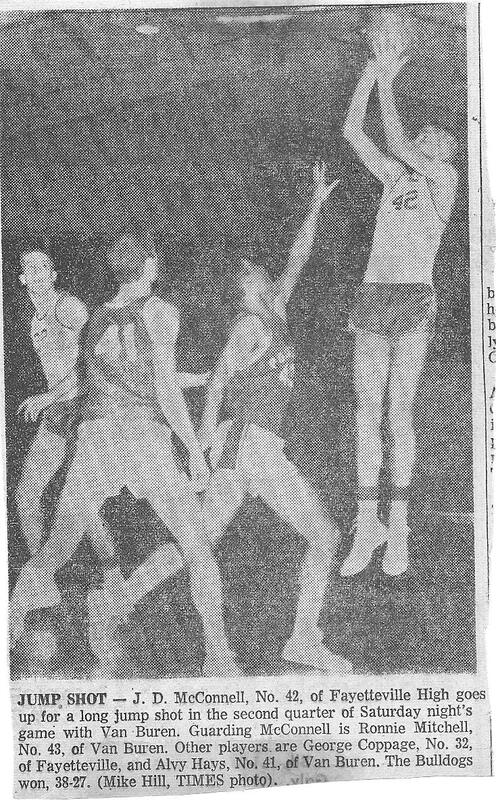 The 1961-62 basketball season belonged to Justin Daniel, who set the single season scoring record, and J.D. 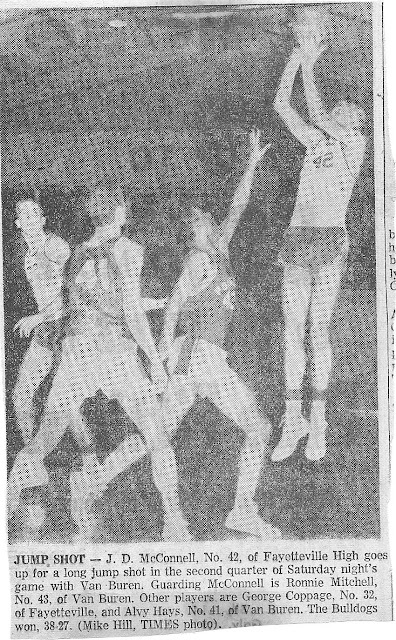 McConnell, who set the record for most career points by a Bulldog. These two tall, talented basketball players led a dominant team, backed by a good supporting cast of players, to the best season an FHS basketball team had ever had. Both Justin and J.D. were extraordinary athletics, but in different ways. Though both were tall, J.D. was a finesse player with a smooth game built on deceptive, deadly passing skills, a classic jump shot, and elusive drives to the basket. J.D. glided up and down the court exerting little apparent effort. With his head turned to the right, he would spot a teammate open on the left and hit him in stride for an easy layup or short jump shot. His was a thinking man’s game, more the nuance of small moves than the bombast of slam dunks. For him, the action was not only in front of him but also on the periphery of his vision, where a teammate might break free or an opponent become inattentive. Then came a quick pass, a solid screen, or a sudden jump shot, usually with good results. Besides his fluidity and uncanny passing, J.D. had one other huge advantage playing guard and, sometimes, forward. He was usually much taller than the player guarding him, while just as quick. He was 6 feet 4½ inches in a league where guards rarely reached six feet and forwards were only a little taller. When J.D. was at the guard position, it often seemed an adult was playing with kids. Justin was not a finesse player. If J.D. was silk, Justin was scratchy wool. At 6 feet 4 inches, a little shorter than J.D., his job was in the middle with his back to the basket, getting rebounds and taking the ball to the basket with alacrity. Yet, he also had, when needed, a delicate touch with his jump and hook shots. Justin typically was guarded by the opponent’s tallest player, so he rarely dominated his matchups with superior height -- many teams had centers as tall as him or taller. Justin did his damage with a hard charging game of getting the basketball, whatever it required, and putting it into the basket, however it needed to be done. Justin got his height early. I know because he was my cousin, who lived just a few blocks away, both of us within a half-block of Jefferson Elementary School. Although he was four years older, I saw him often in my grade school years because I sometimes hung out with his brother Morris, who was only a year older than me. I think I was in the third or fourth grade when Justin -- who was already tall -- had such a fast-growing spurt that, for a while, he found it difficult to do such basic tasks as bend over and tie his shoes. During my first year in Little League (I was 9 and Justin was 12), he was a terrifying baseball player. He was by far the best player in the league and famous for how hard he pitched and for hitting eye-popping home runs at the Fayetteville City Park that not only left the field, but went over the street and hit a big apartment building a few hundred feet away. If you were a batter facing his fast ball, you went to the plate regretting that your mother had let play baseball so young. If you were a pitcher standing barely 40 feet away from this guy, you had to fear for your life. I learned much about how to play baseball from Justin, Morris, my cousin Jerry Durning (aka Monk, who was a very good catcher), and others who lived in the south part of town. On Sundays during the school year, and almost any time during the summer, pickup games were formed on the lower field of Jefferson. Justin lived just a few steps from this field and usually was one of the people who picked the teams. In those games, which were great fun, we were scared about one thing in particular: We feared that Justin would hit a ball about 350 feet over the trees in left field and break the picture window of the car repair shop across the street. If that happened, we would all be in big trouble. Later, for a couple of summers, Justin, Morris, Jerry and I (and others) played “sock ball” using the Jefferson building as a backstop. I think Justin started game; I continued playing it years after he quit. The first step in the game was to make the sock ball. To do that, we cut open an old golf ball and extracted the little rubber ball in the middle. Then we took old socks with holes in them and started wrapping them around the little ball. With two or three socks properly wrapped around the little rubber ball, then sewn together, you had a baseball size “sock ball” with some heft, but also one that would not travel too far when hit or hurt too much if it hit you. A strike zone was drawn in chalk on the side of the building and a batter’s box outlined on the asphalt. Some rocks were set down around an imaginary infield to delineate where a ball, if passing there on the ground, would be a hit. Otherwise, grounders were outs as was anything caught in the air. A fence beckoned for home runs. Other trajectories of hit balls were subject to prolonged, sometimes bitter, debate as to whether they were hits or outs. The main thing to avoid in the game was hitting a hard line drive to the left of third base, which could bust a window. Mr. Tincher, the Jefferson custodian, was a really nice guy, but he had to charge you 50 cents for a window replacement, and that was enough to buy a few visits to the Palace Theater. And so we played a schedule of round robin games, kept standings, and had fun for a summer or two, until Justin and Jerry outgrew sock ball and went on to organized sports. I still traded baseball cards with Justin every once in a while, but once you get into high school you don’t want to mess around with kids. The year that Justin was terrorizing the Little Leagues, I was on the McIlroy Bank team with J.D. I have a picture somewhere that proves it, but without that I would not remember it for sure. The picture shows that J.D. was plenty tall when he was 12 years old. With the age difference, we weren’t pals. 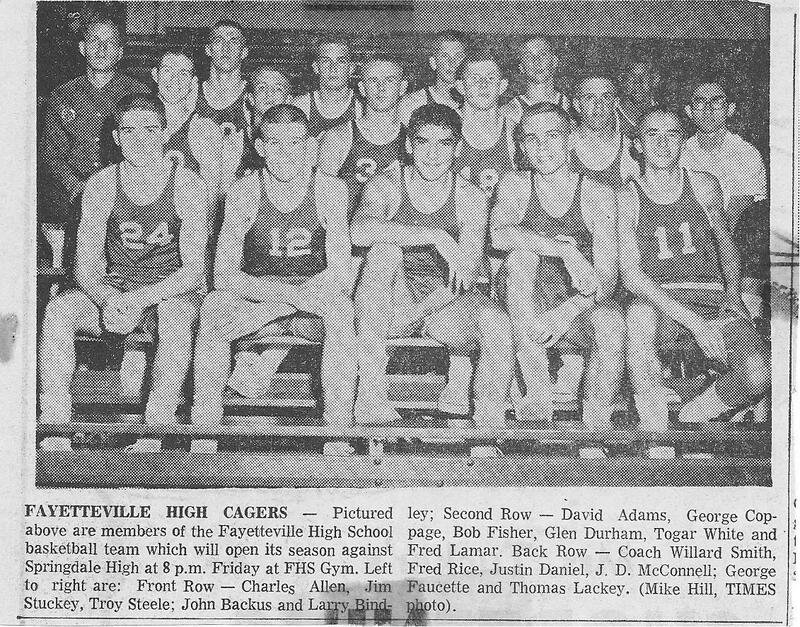 In addition to Justin and J.D., the 1961-62 FHS team had several very good athletics. One of them was George Coppage, who excelled in football and was not afraid of contact on the basketball court. You could usually count on him to give you four good fouls a game. He was listed in the program as 6’ 2’’. I doubt he was quite that tall. (Coach Smith listed me as 6 feet 1½ inches three years later, which would have been true only if I had been measured standing on a very thick book.) After he graduated, Coppage was signed by Frank Broyles to play football for the Arkansas Razorbacks. The team also had Freddie Rice, a junior who was listed at 6’ 7’’, taller than either Justin or J.D. Freddie played forward because the center position was already occupied, and he had several high scoring games. Though Freddie lacked some of the athletic ability of Justin and J.D., he was good enough to get a University of Arkansas basketball scholarship after he graduated in 1963. He averaged over 14 points a game for freshman Razorback team and had a memorable game in which he broke the record for most points scored in a game by a UA freshman. He played a few games his sophomore year at UA, but did not return after that. The season was one of streaks. Fayetteville won its first fifteen games, lost its 16th in Missouri, then won twelve straight. Early in the season, the team was ranked first in the state by the two major polls that did such rankings. It stayed at number one through the end of the regular season. I attended a few of the games and listened to Wally Ingles broadcast many others. When FHS played at home, the gym was packed. The action was inspiring for a fledgling basketball player like me. Justin always looked confident, though often scowling; apparently he was frequently irritated at something or someone. J.D. was always relaxed, moving around like he was taking a stroll between classes. (One thing that struck me about J.D. : big feet. His shoes seemed twice as long as mine.) Both Justin and J.S. had plenty of swagger on and off the court. From FHS Yearbook. Justin is shooting, J.D. (42) and Coppage (back to camera)are running in to rebound. One other FHS player that I particularly liked to watch was Troy Steele, a 5’ 10” (or smaller) guard who was quick and a hustler. At least early in the season, he played quite a bit and seemed to energize the team. Sadly for the team, he was no longer playing for F.H.S. at the end of the season and missed the state tournament. He had to leave the team because he got married during the season and was expelled from the high school. As I watched the two dominant players on the court, and thinking about it later, I often wondered how Justin and J.D. got along. They had such different personalities (cool vs. intense) and backgrounds (north Fayetteville white collar vs. south Fayetteville blue collar), I doubted that they were inclined to be close friends. I never found out if there were any conflicts between the two. I hope that they saw each other as good teammates and had healthy doses of mutual respect. After winning the Ozark Conference and going undefeated in Arkansas, FHS traveled to Little Rock in early March to play in the state tournament. I am sure that the team members and Coach Smith expected to win the state AA-AAA championship. The stats show that Freddie Rice had big game with 17 rebounds and 12 points. Justin and J.D. had so-so nights for them, but Coppage, Faucette and Backus had joined with Freddie to make up the difference. Coppage had his usual four fouls. 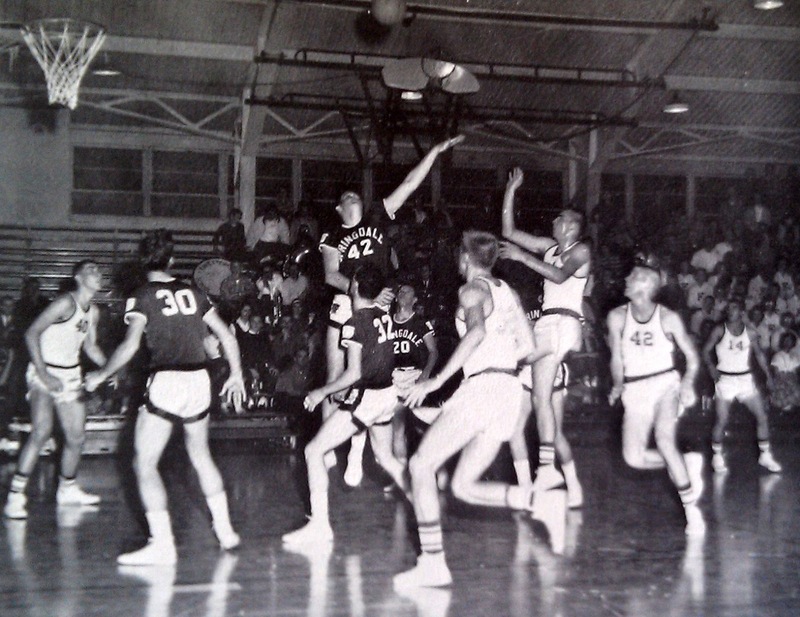 The next game was the tournament semi-final game against North Little Rock, which had a 21–6 record. Over 7,000 people showed up at Barton Coliseum to watch it. The night was frustrating for the FHS Bulldogs. 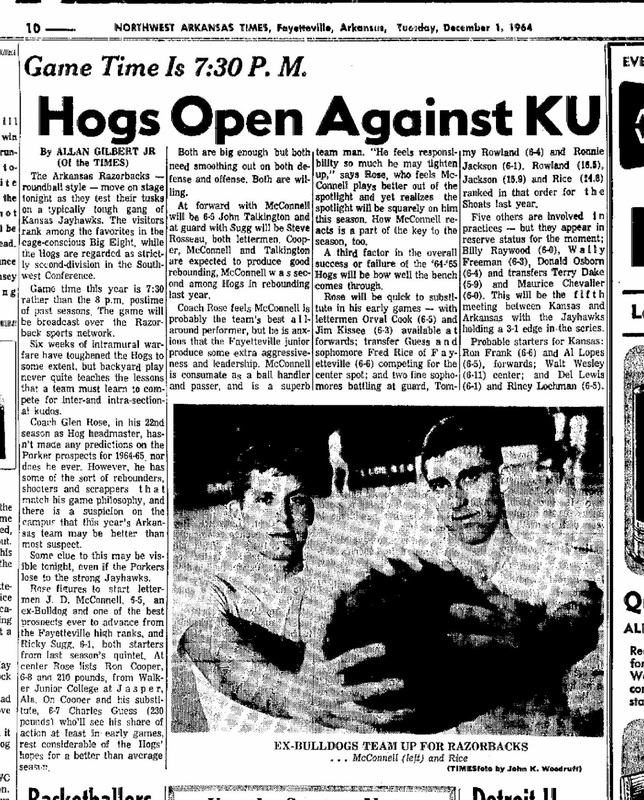 Though NLR was smaller, it out rebounded the Bulldogs and, according to the Northwest Arkansas Times account, intercepted “seven key passes.” Clearly, the team suffered from the loss of Troy Steele as a ball handler. Fayetteville lost the game by 59-54, but had chances at the end to pull out a win. Ultimately, the game was decided by free throws. FHS hit 10 of 15 free throws while NLR made 19 of 25. In comparison, FHS made 22 baskets while NLR made 20. Though the season ended sadly for the FHS team, it still was a fabulous year. This team had the best winning percentage in the history of FHS basketball team. The next closest was a 28-3 record in 1947-48. During the season, Justin scored more points (504) than had ever been scored in a season by an FHS player. Also, J.D. set the record for the most career points scored by an FHS player (869). Both were showered with honors, including all-district and all-state. 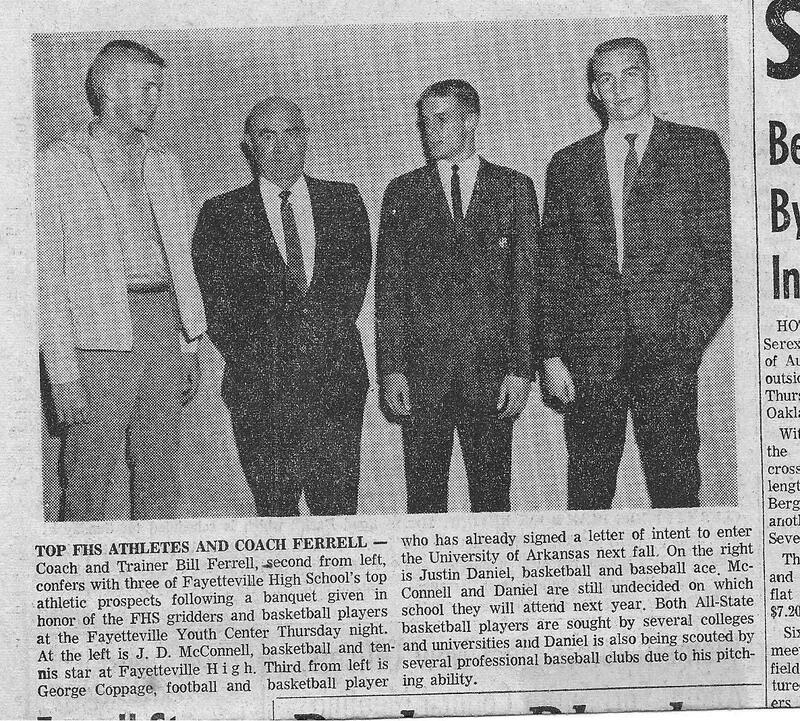 Both were selected to play in the Arkansas High School All Star game in August 1962. Although Kentucky scouts had come to watch J.D. play, he (apparently, I don’t know for sure) did not receive a basketball scholarship offer from them. According to the NWA Times, both Justin and J.D. received basketball scholarship offers from the University of Arkansas and some smaller schools. Some people expected Justin to sign to play professional baseball. Both accepted the UA basketball scholarships. 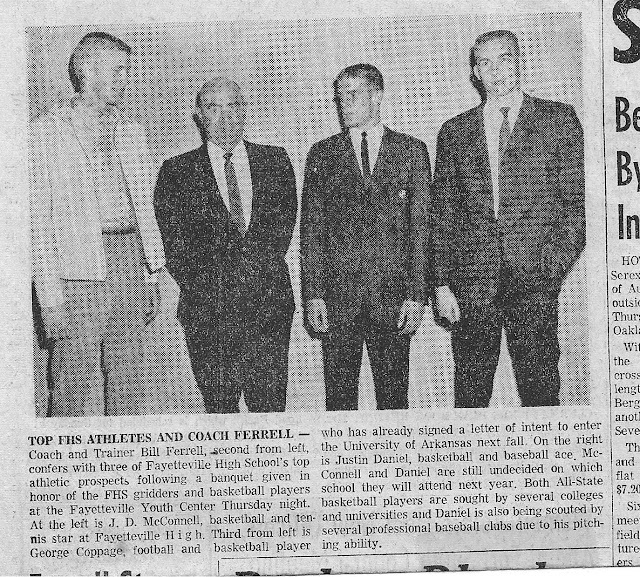 They were joined at UA by two Arkansas players who also were in the 1962 Arkansas All-Star basketball game: Ricky Sugg of Berryville and Steve Rousseau of Dewitt, Arkansas. Justin and J.D. played on the Razorback freshmen basketball team (the Shoats) during the 1962-3 season. At the time, freshmen were not eligible to play varsity sports. In a dozen games, J.D. scored 156 points, 13.1 points per game. Justin scored 116 points, averaging less than ten a game. He decided not to return for his sophomore year. One day, I think it was in late summer 1963, I got a call from Bubba McCord who told me that a baseball scout who was thinking about signing Justin to a pro contract wanted to see him in a tryout. The guy asked if we would help him with it. I was needed to pitch to Justin and Bubba would catch. Of course, I jumped at the chance. When we showed up at the fairgrounds, it was clear that I was much more nervous about Justin’s tryout than Justin, who seemed to be nonchalant about the whole affair. Bubba and I did our best to impress the scout while Justin did his thing. I tried to throw strikes so Justin could blast them, which he did. Justin was sufficiently impressive: he signed a professional contract with the Kansas City Royals. In 1964, at the age of 19, he played for Wytheville, VA in the Rookie League. His stats are on-line: he hit .288 in 212 at bats with seven doubles, 3 triples, and 4 home runs. Not bad, but before the season was over, he was sent home. The word was that he had an injury. During the next ten years, Justin was a top player in the Northwest Arkansas Industrial Basketball League and on Fayetteville semi-pro baseball teams. In 1964-65, he averaged almost 30 points a game in basketball and in 1965 his baseball team, Ken’s Sporting Goods, won the semi-pro title with the benefit of his pitching and hitting (including two home runs in the final game). In 1971, Justin was the MVP in the Arkansas semi-pro baseball tournament and his team, Farmers Insurance Group, won the state championship. And on it went year after year. At some point, I think it was in the early 1970s after I had left Fayetteville, Justin started a business dealing in baseball cards. This grew into a retail business selling sports cards and memorabilia, with a store, Justin’s Clubhouse, just off of College Avenue. Justin ran the business until his death in 2006, at the age of 61. After graduating from UA, J.D. studied medicine and became an M.D. When I was living in Little Rock in the 1970s, I would occasionally see him at the Y.M.C.A or at some city league basketball game. I do not know where he is now or what he is doing. However, when I googled “J.D. McConnell” and Little Rock recently, I got a picture showing a tall, gray-haired guy with big feet hitting a drive at a Little Rock golf course. It was J.D. The picture’s caption was: “J.D. McConnell of Little Rock watches his tee shot on the first hole while playing a round of golf with friends on a spring-like day at War Memorial Park in midtown Little Rock, January 31, 2011.” He retired and, the last I heard, was doing quite well.